1. You must be custom fitted, this must take place in the Portland Metro Area (Oregon). 2. You will not get the patches that they have on our uniforms. 3. The cost will be $225. 4. 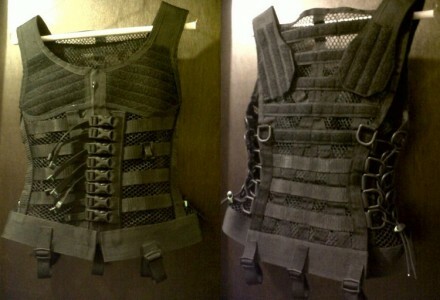 It will take up to 2 weeks after the fitting before it is ready. Interested parties may contact NZCS via private message on their Facebook page. 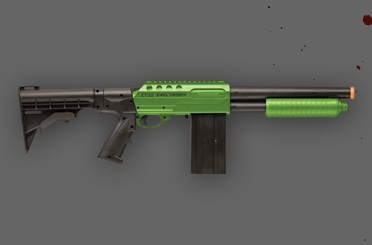 Remington has expanded their line of Versa Max semi-auto shotguns to include two “zombie” coatings: Gargoyle Green and Pink Explosion. 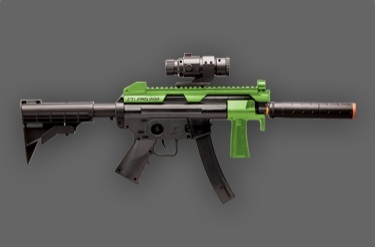 Versa Max shotguns feature an 8+1 capacity with the use of 2 3/4″ shells, the ProBore choke system that includes both IC and tactical extended choke tubes, oversized bolt release, oversized bolt release button, and oversized trigger guard, receiver mounted picatinny rail, HiViz front sight, and picatinny barrel clamp for accessories mounting. 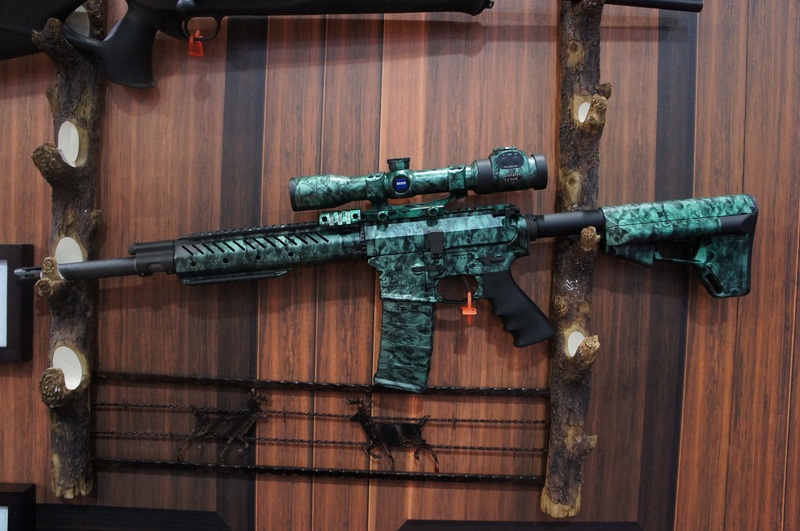 The Christensen Arms Zombie AR Package uses a Christensen Arms CA10 or CA15 as the base firearm and includes a ZEISS Conquest Duralyt 1.2-5×36 #60 illuminated scope. 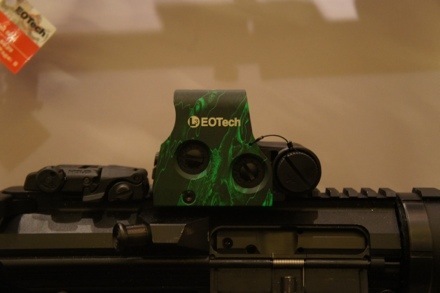 The rifle and scope are both dipped in green zombie camouflage. According to the company, the package is supposed to be available this month. 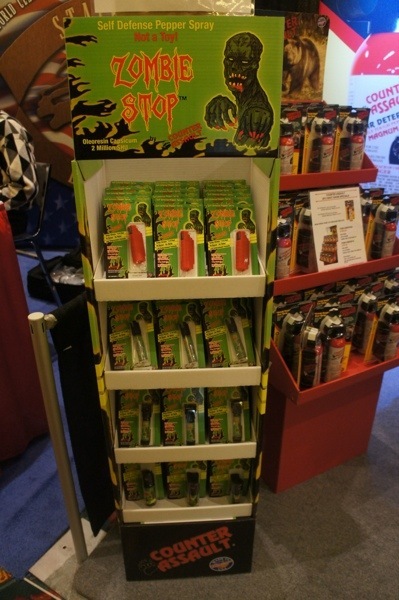 Zombie Stop is a series of pepper spray products by Montana-based company Counter Assault. All four products spray a green-colored stream or fog distances varying between 6 to 12 feet. The spray is a non-flammable, oil-based, law enforcement-grade formula (Oleoresin Capsicum – 2 million SHU) with a 5 year shelf life. 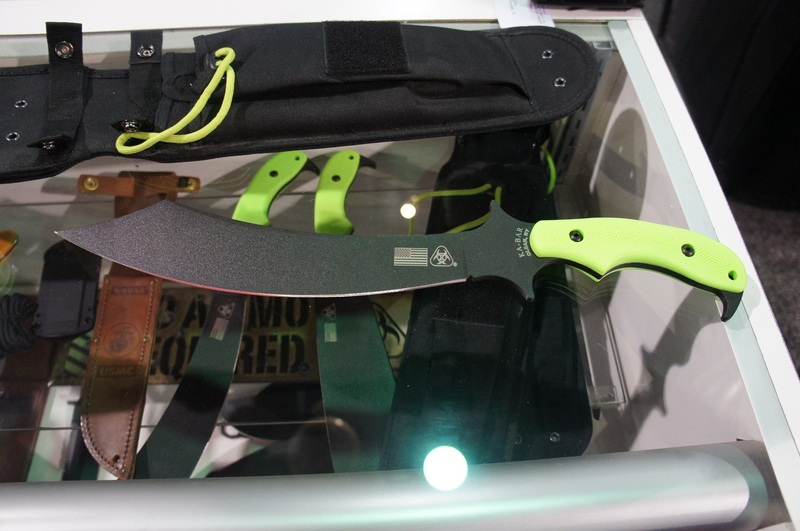 KA-BAR has expanded their line of Zombie knives to include the “Zomstro” and “Swabbie” style blades. 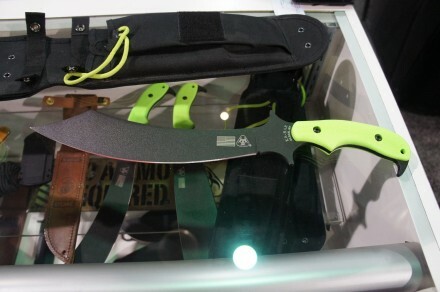 Both blades are constructed from SK5 1095 Cro-Van steel and come with nylon sheaths with a front stuff sack. 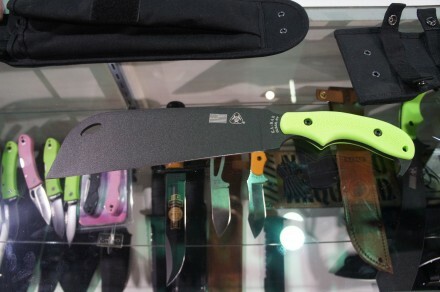 The handles comes standard green, although a replacement set in black comes with the knives. Made in the USA. 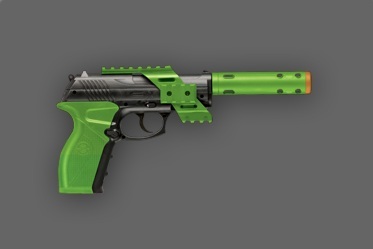 Zombie Coat is a new line of DuraCoat protective firearm finishes, but with a host of zombie and undead-themed names. Zombie Coat comes in the following colors: Graveyard Black, Tombstone Gray, Blood Red, Biohazard Yellow, Zombie Green, and, my favorite, Rotting Flesh. German company TACWRK has put together a zombie survival kit for the year 2012. 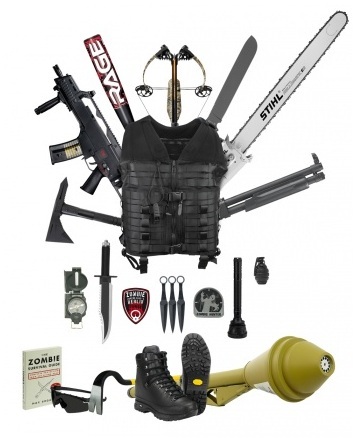 Included with the kit: Stanley Fatmax crowbar, SOG Voodoo tomahawk, replica Panzerfaust, baseball bat, Mission Archery MXB-360 crossbow, Oakley M-Frame 3.0, replica hand grenade, replica H&K G36, ‘The Zombie Survival Guide’ by Max Brooks, Hanwag Alaska GTX boots, Fenix ​​TK70 flashlight, Böker machete, Stihl MS880 chainsaw, compass, ‘Rambo: First Blood Part II’ replica survival knife, replica Walther SG68 RAM shotgun, United Cutlery Expendables Kunai 3 piece thrower set, Tasmanian Tactical TT Vest Base, ‘Zombie Hunter’ patch, and ‘Zombie Hunting Club Berlin eV’ patch. The Price? € 8,999.00, plus shipping. Hooray! Hollywood is completely missing the point of the book being an account of a world recovering from a massive zombie war as told from the perspective of multiple people. Instead, they’ve turned it into a generic modern zombie flick with a god-like-solve-all-problems solo protagonist in Brad Pitt! I’m totally sure it’s a way better story. 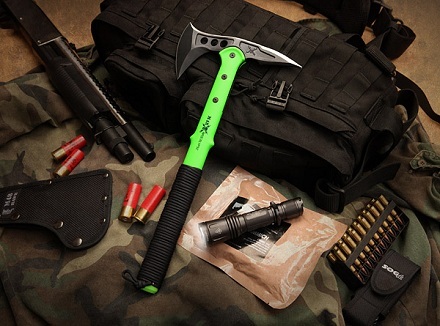 While it has a bright green ‘zombie’ handle, the M48 Apocalypse Series Tomahawk does have some good features going for it. The 8″ head, constructed from 2Cr13 stainless steel, has two sharpened blades, the axe and spike. 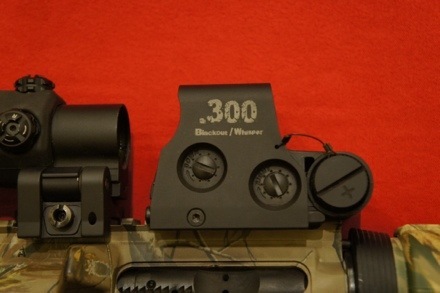 The 30% nylon reinforced handle secures the head with three separate bolts and is wrapped in black paracord. The M48 also comes with a nylon belt sheath with belt loop and snap closure buttons. 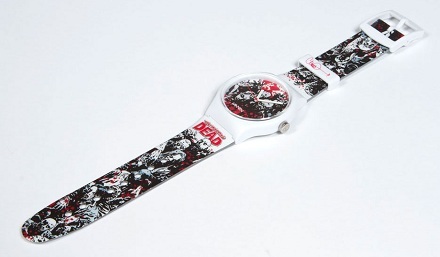 It’s a United Cutlery piece, and they do offer a ‘non-zombified’ all-black version as well, if the Apocalypse model isn’t your thing. The Walking Dead Escape at Petco Park in San Diego, CA gives those who participate a chance to experience the thrill of a zombie apocalypse turned obstacle course as either a survivor, walker, or a spectator, watching the carnage unfold safely from the sidelines. The course is specifically designed for people with a wide range of abilities, including obstacles such as rope bridges and cargo nets, but includes an easy path if the challenges prove a bit too difficult; this path does increase of becoming walker chow, however. The event is pay-for-play ($80 a head) and runs from July 12-14. You can find out more details on the official website. Thanks to Dev for the tip! THE ULTIMATE AR-15 MALL NINJA TACTICAL ZOMBIE DESTROYER! 1 M&P-15, 1 muzzle break, 3 lasers, 4 flashlights, 3 red dot sights, 9 30-round magazines, 1 forward grip bipod, 2 additional laser/flashlights, and 2 additional horizontally mounted magazines = one 100% badass mall ninja zombie killin’ rifle! Yet another video of an individual dressing like one of the undead and terrorizing random people. Although this one seems at least partially scripted, you have to wonder when one of these zombie pranks will end in tragedy. Are you a big fan of the choose-your-own-adventure genre, but are hoping for something more zombie intensive? Well, Mongadillo Studios has an iPad app called ‘ZDAY Survial Simulator HD that may serve that need. 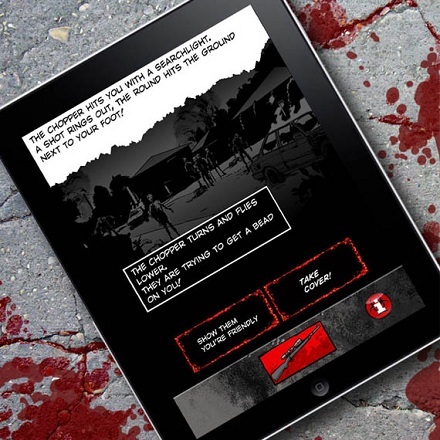 The app is text and picture based and takes place in a zombie apocalypse scenario where you have to make various choices throughout the story to determine your fate. If you’re not totally sick of zombie-themed, well, anything by this point, you can pick the ZDAY Survival Simulator HD at the iTunes app store for $2.